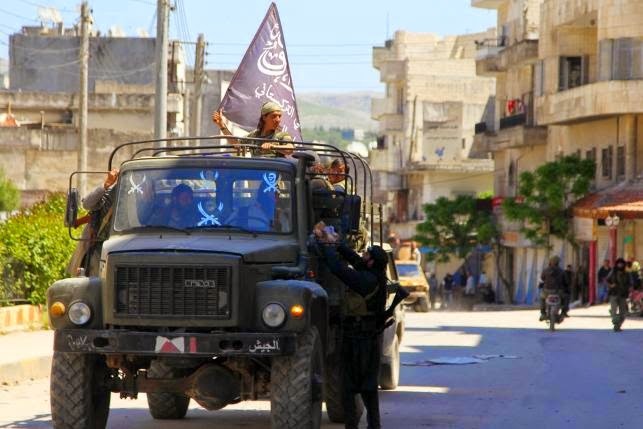 An al-Nusra Front-led coalition of Islamists on Saturday captured the town of Jisr al-Shughour, the second largest city in northern Syrian province of Idlib. They had already captured Idlib City, the provincial capital, in late March. Jisr al-Shughour sits on the strategic M4 Highway, directly leading to Latakia, the principal port city of Syria, 47 miles (76 km) to the south. The coastal Latakia is also the Alawite stronghold. The fall of Jisr al-Shughour represents a significant advance by the insurgents toward the government-held coast. The battle for the town also signaled an alliance emerging among groups opposed both to the Assad regime and to ISIL. Al-Nusra, the Syrian affiliate of al-Qaeda, other hardline Islamist groups and the Free Syrian Army have made advances in the north and south in recent weeks. Just hope the Syrian people end this conflict.There is no doubt there should be no place for ISIL/ISIS or the Assad regime in Syria's future. Islamic regime should stop financing terrorists in Lebanon and the Assad regime.No thanks to Akhoonds Iran has its own colossal problems to deal with.